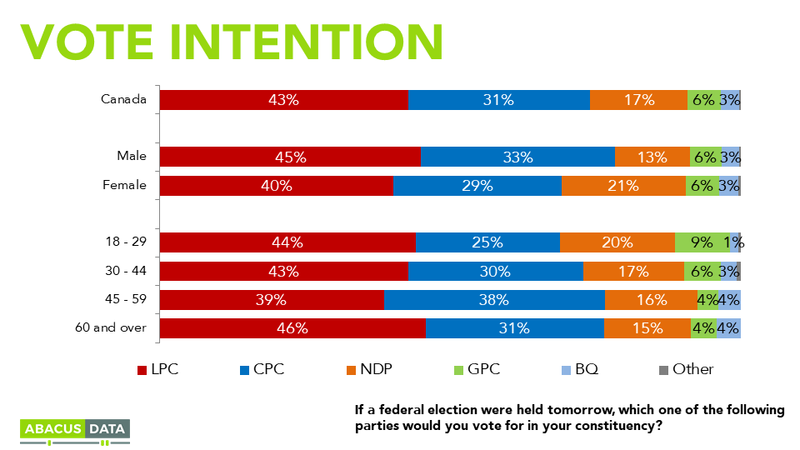 Our latest polling on the political mood of Canadians shows that if an election were held today the Liberal Party would garner 43% support, compared to 31% for the Conservatives and 17% for the NDP. These numbers are in line with our results from July. 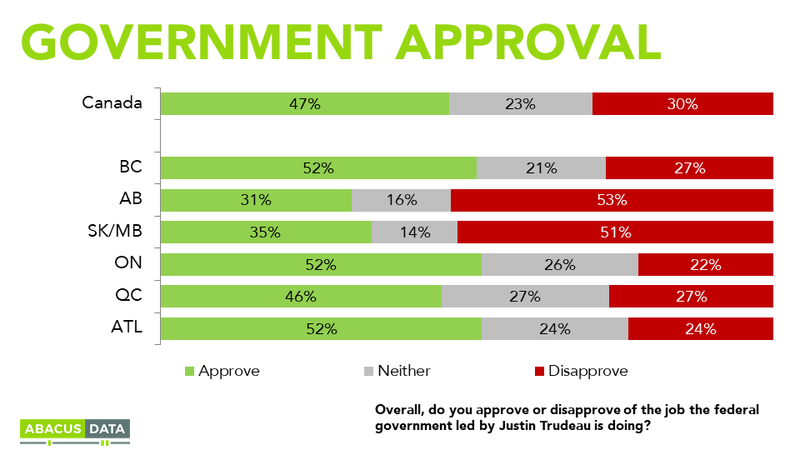 Government approval for the Liberals has held at around 50% since the end of 2016, with 47% saying they approve of the job the government is doing, and 30% who say they disapprove. When it comes to views of Prime Minister Trudeau, 47% say they have a positive opinion, compared to 28% who have a negative opinion. 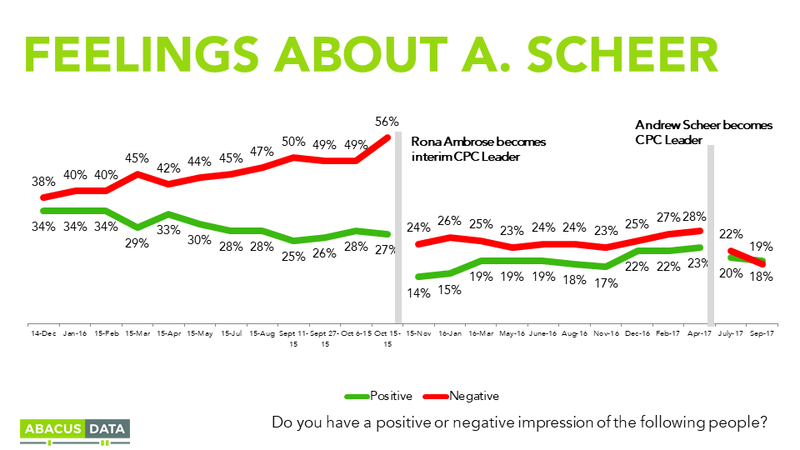 For Conservative Leader Andrew Scheer, 19% say they have a positive opinion, compared to 18% who have a negative opinion. 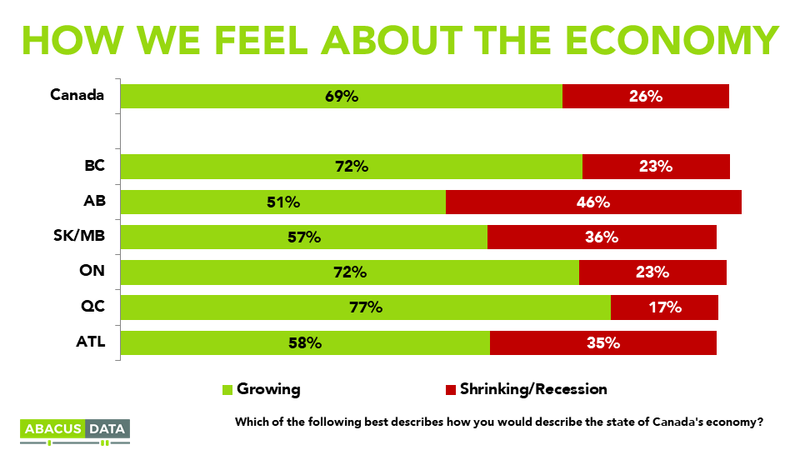 Continued warm feelings about the government are likely due in some part to the fact that more than two out of three (69%) say they feel the economy is growing today, the highest number we have seen in several years. On a regional basis, we see the Liberals with an 23-point lead in Ontario, a 22-point lead in Quebec, and an 18-point lead in BC. 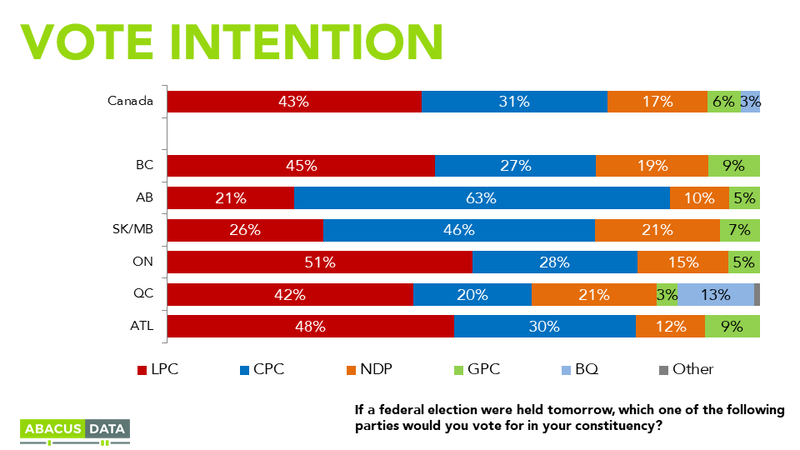 The Liberals have a 12-point lead among men, and an 11-point lead among women. The Liberals have a substantial lead among all age groups except voters 45-59, where they are effectively tied with the Conservatives. Among self-described left of centre voters, the Liberals have 56% support, compared to 24% for the NDP. Among voters who consider themselves centrists, the Liberal Party has 43% support, compared to 29% for the Conservatives and 17% for the NDP. Among voters on the right, the Conservatives have 66% support, compared to 22% for the Liberals. The Liberal Party lead is built in part on the fact that 47% say they approve of the job the government is doing, compared to 30% who disapprove. This rating has hovered around the 50% mark since the end of 2016. Approval is the plurality view across all age groups, and in every region except the Prairies. 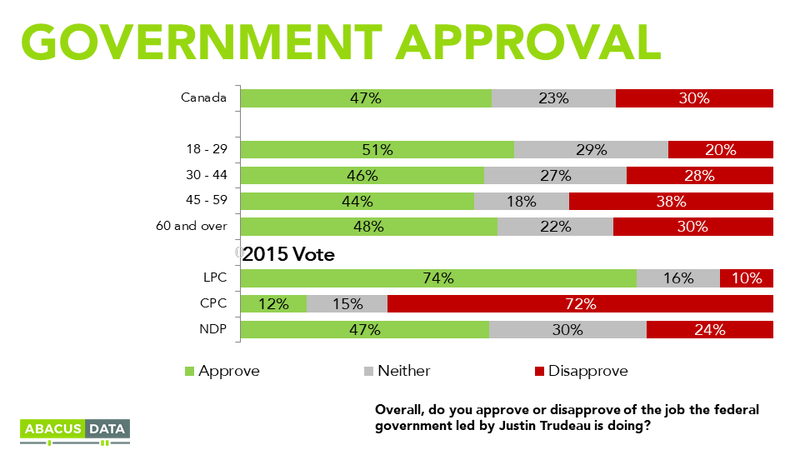 Perhaps most important to the Liberal fortunes is the fact that by a margin of 47% to 24%, those who voted NDP in the last election approve of the job the Trudeau government is doing. 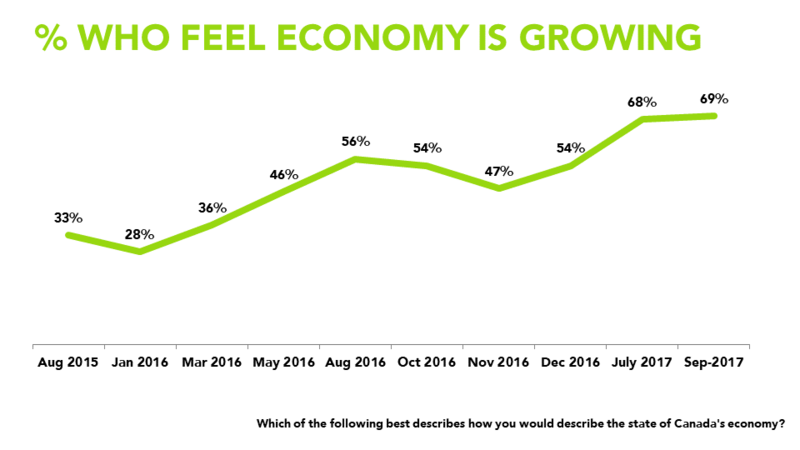 More than two out of three (69%) say they feel the economy is growing today, the highest number we have seen in several years. A majority in every region, says the economy is growing rather than shrinking, led by particularly positive sentiments in BC (72% growing) Ontario (72% growing) and Quebec (77% growing). In Alberta, where the economy suffered downward pressure due to declining oil prices, we now see a majority (51% growing/46% shrinking) seeing growth in the economy. 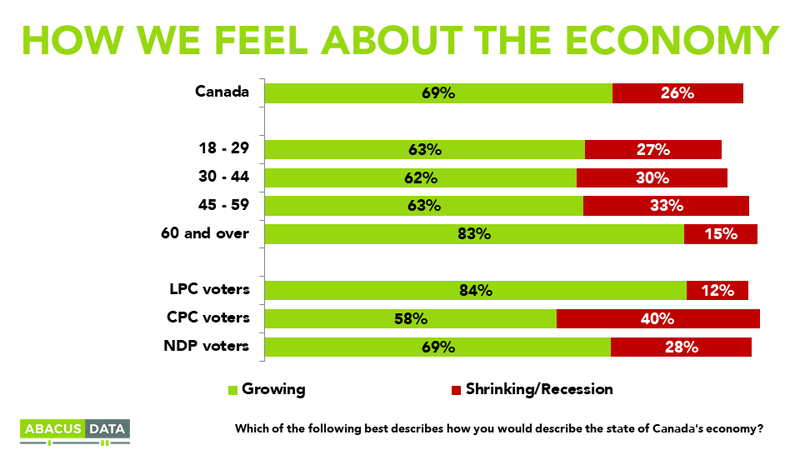 Among different partisans, Liberal voters are most likely to say the economy is growing (84%) but 69% of NDP voters and 58% of Conservative voters also feel that way. 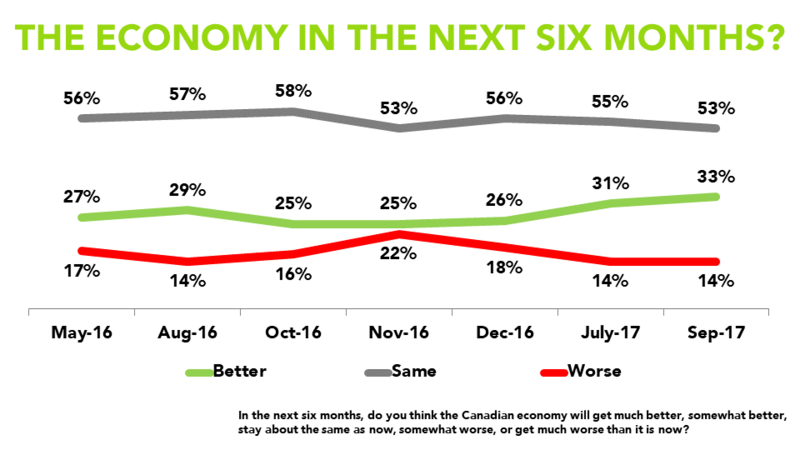 When asked how they feel the economy will be in the next six months, our tracking shows an uptick in optimism as well, with 33% saying they expect things will get better, compared to 14% who anticipate a worsening. This net +19 optimism compares to a +3 score last November. When it comes to views of Prime Minister Trudeau, 47% say they have a positive opinion, compared to 28% who have a negative opinion. These numbers are slightly improved from those we saw as the House of Commons recessed. For Conservative Leader Andrew Scheer, 19% say they have a positive opinion, compared to 18% who have a negative opinion. These numbers are not that dissimilar to those found for Rona Ambrose. 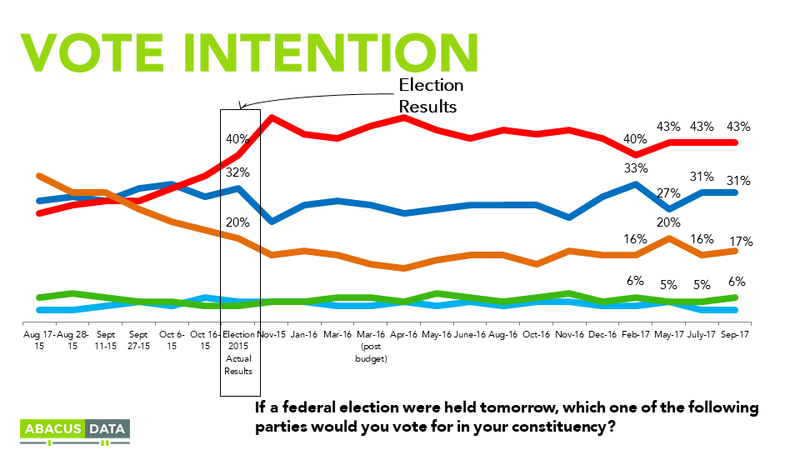 According to Bruce Anderson: “Over the last few months we’ve seen data where the Liberal lead was narrower than it is today – a reminder that opinions can be subject to shifting moods. 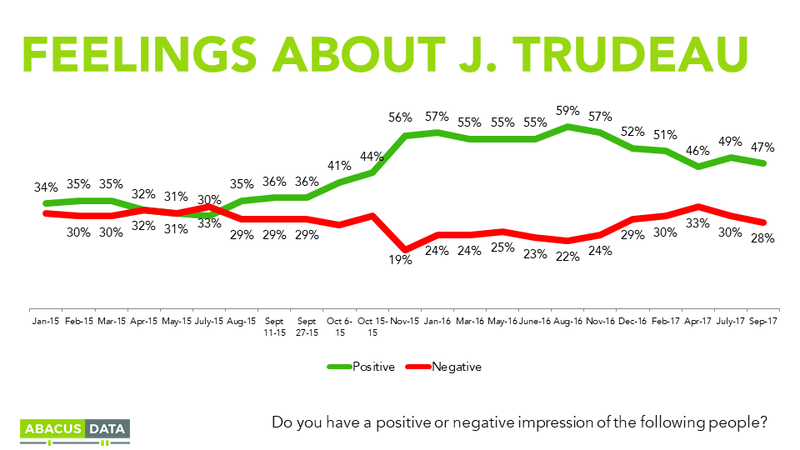 For the moment, the Liberals continue to enjoy a lead based on positive feelings about Justin Trudeau, positive feelings about the economy, and generally good approval ratings for the Liberal government. Attentiveness to the controversial Khadr settlement appear to be waning, and our results don’t (at least for the moment) pick up indications that the hotly debated individual corporation tax change proposals have created a backlash. Instead, economic confidence seems to be the prevailing sentiment affecting federal politics. 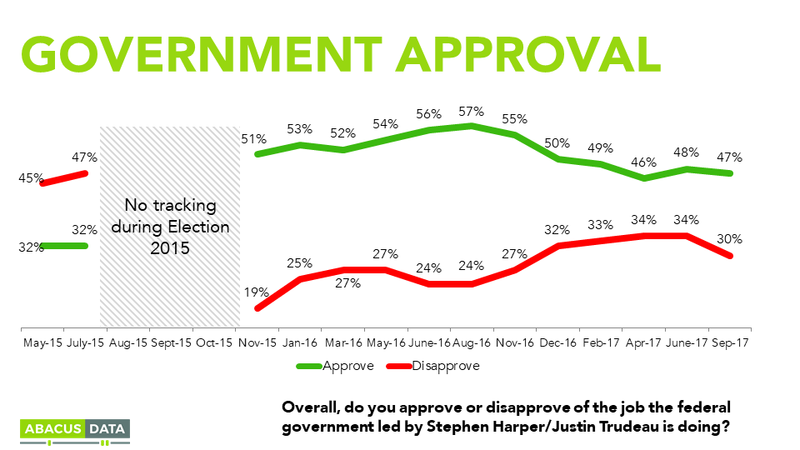 According to David Coletto: “Support for the Liberal government and the Prime Minister personally remains quite strong as the government hits the half-way point of its four-year mandate. 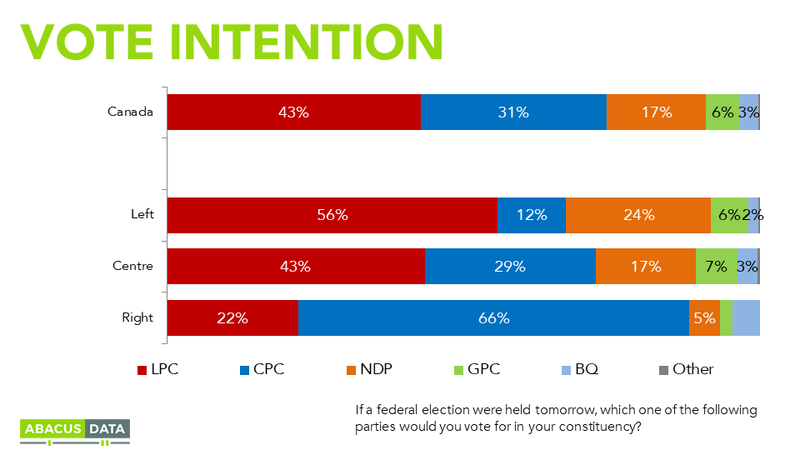 The Liberal Party continues to poll well in the three largest provinces and its coalition of supporters is broad encompassing Canadians from across demographic and socio-economic groups. Our survey was conducted online with 1,512 Canadians aged 18 and over from September 1 to 3, 2017. A random sample of panelists was invited to complete the survey from a large representative panel of over 500,000 Canadians. The Marketing Research and Intelligence Association policy limits statements about margins of sampling error for most online surveys. The margin of error for a comparable probability-based random sample of 1,514 is +/- 2.6%, 19 times out of 20.